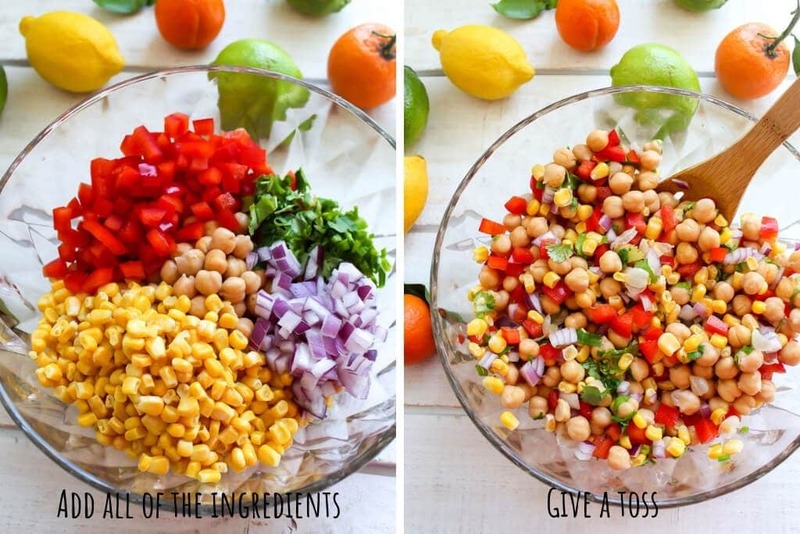 This citrus salad with chickpeas and veggie confetti is a healthy, colorful, vegan, and gluten-free salad. This citrus salad is my version of the tri-colored chickpea salad that they sell pre-made at Costco and Wegman’s. It’s bright and cheery, makes a beautiful side dish, and it’s the perfect summer salad to bring to a potluck or picnic! This fresh-tasting salad can be made ahead of time and works great for meal prep and lunches too! bursting with fresh flavors from oranges, limes, and fresh herbs. the perfect dish to bring to a summer picnic! great for making ahead and meal prepping lunches! 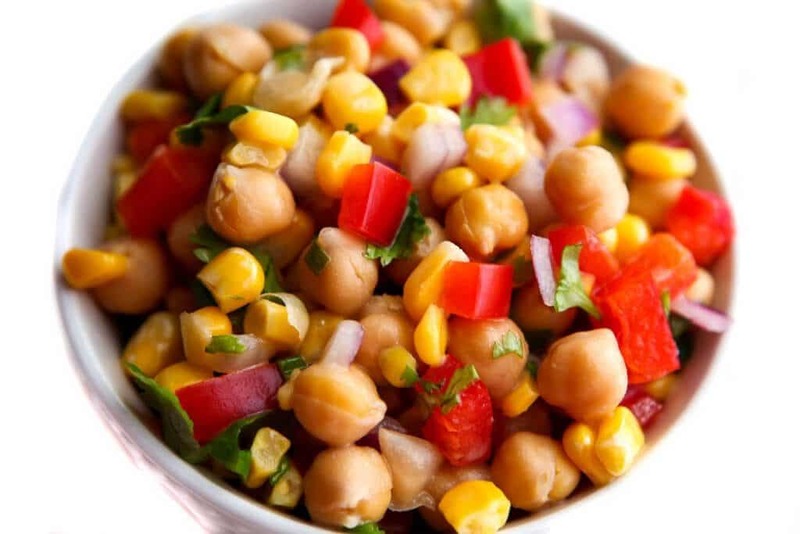 Chickpeas – You will need about 3 cups (or 3 cans) of cooked, drained and rinsed chickpeas. Red Pepper – 1 medium-sized bell pepper. Orange or yellow will also work, but red makes it more colorful. Corn – Frozen corn works the best. Red Onion – This is optional, but adds a lot of flavor and color. Be sure to soak the diced onion in some water for 5-10 minutes. This will mellow the flavor of the onion. Green Onions – A few stalks of green onion add a lot of flavor and color. Cilantro – This is also optional, but if you like the flavor of cilantro, it’s highly recommended. The cilantro and lime juice taste amazing together! Orange Juice – You can use it from the carton or fresh squeezed. Lime Juice – Fresh squeezed tastes the best! You will need about 1-3 limes depending on the size and how much juice they have in them. Oil – (Optional) This helps to make the dressing rich and creamy. Canola oil gives it the best flavor. (You can leave out the oil, but the dressing with not be creamy). Agave – To sweeten the dressing. You can use sugar, maple syrup or whatever sweetener that you wish, but like like the flavor of agave with the citrus. Vinegar – To give the dressing acidity. 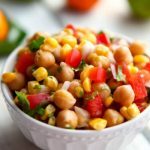 How do I make this citrus salad with chickpeas? Dice the red onion, then place in a small bowl and cover with water. Let them soak while you prepare the rest. 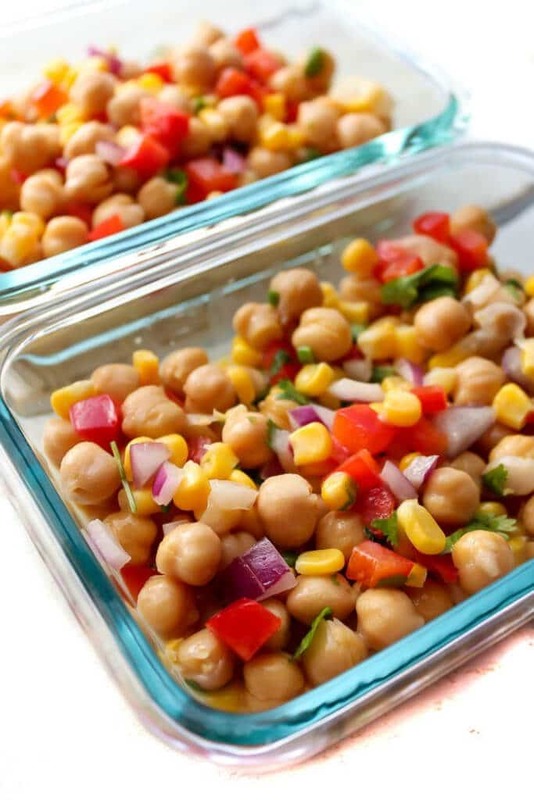 Drain and rinse chickpeas and place them in a salad bowl. Wash and dice the red pepper and add it to the bowl. Chop the fresh herbs and add them to the bowl. Drain the red onion that has been soaking and add it to the salad. Add the orange juice, lime juice, agave, oil, vinegar, and salt into a blender. Blend for about 20 seconds until creamy. 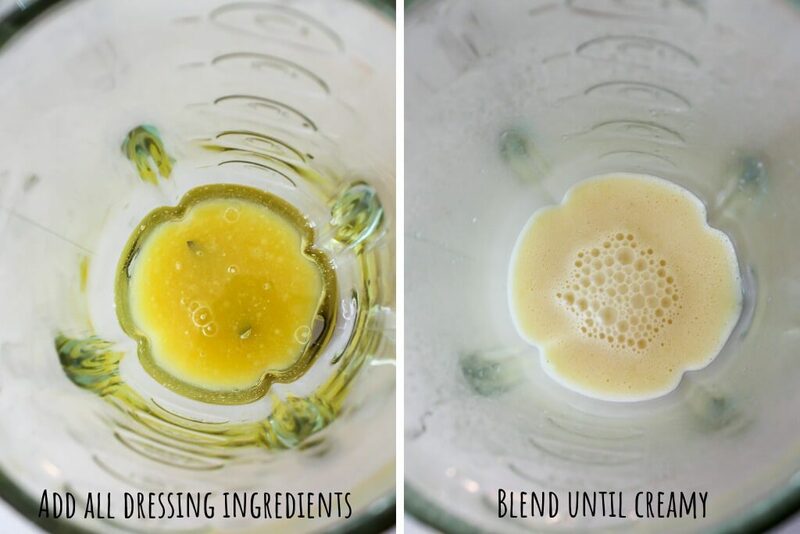 (The acid in the vinegar, orange and lime juice interacts with the oil and turns it white and creamy when blended). Is this salad good for lunches and meal prep? Yes! Make a big batch and use it for a quick and easy lunch food prep. It keeps well in the fridge for about 3 days and it’s one of those salads that tastes better if it has at least a few hours to sit and soak up the flavors. If you have a pot picnic or pot luck, just make it the night before and it will be perfect the next day. 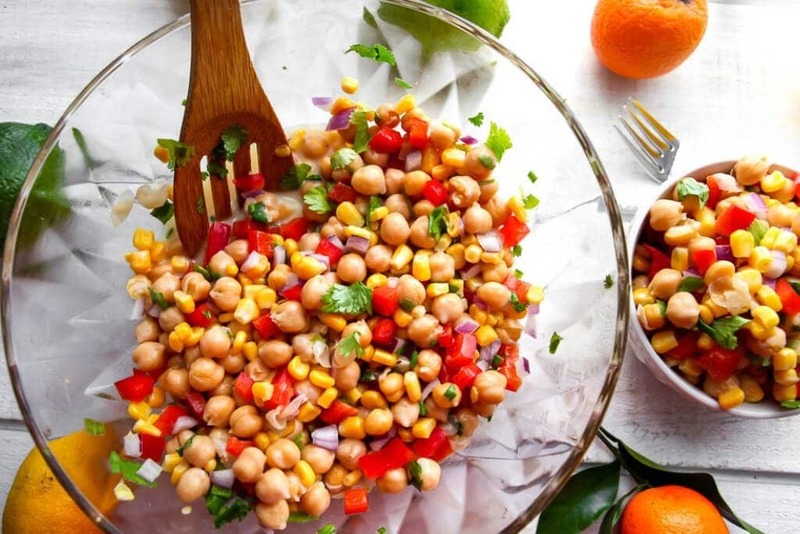 Chickpea Citrus Confetti Salad is one of those meals that is great to make up and keep in the fridge for healthy snacks, easy lunches, or a satisfying side. 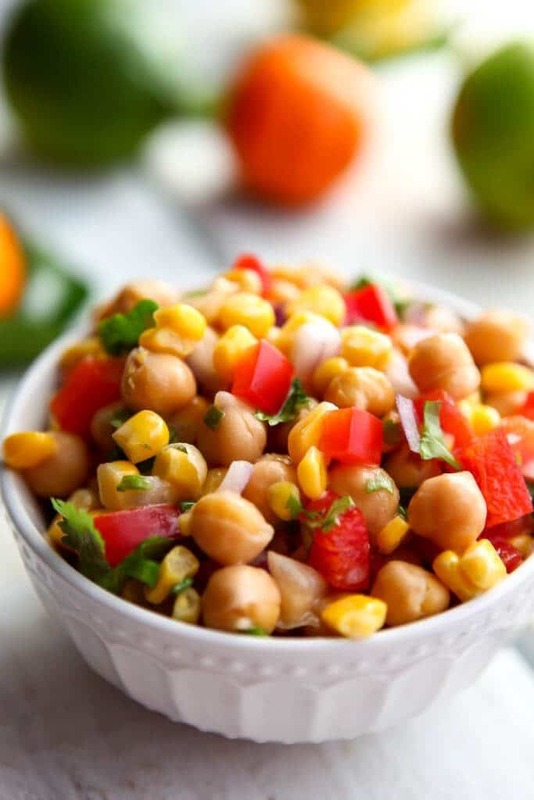 The protein from the chickpeas fills you up while the lime and cilantro combo hits the spot! I know that there are people who hate cilantro, and if you are one of them, just leave it out. I personally think that lime and cilantro is totally addicting! Kids like it because it is colorful and fun! The sweetness of the orange juice and the agave nectar keep them eating it up. Add a little more sweetener and leave out the strong flavors of the onions and/or cilantro to make it more kid-friendly. If you love this salad, check out my Easy Chickpea Garlic Vinaigrette Salad, for another super easy, make-ahead summer salad! 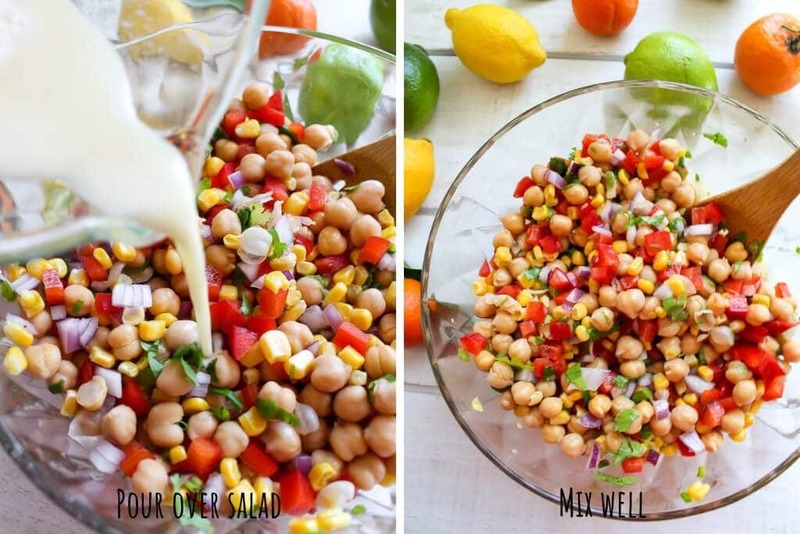 Don’t forget to save all of that liquid that you drain off of the chickpeas! That liquid is aquafaba and it can make some amazing desserts! A slightly sweet summery citrus salad made with chickpeas and finely chopped veggies. Vegan, gluten free, and soy free. Chop the red onion and then put it in a bowl with enough water to cover it. Set aside for a few minutes. (This will mellow the flavor of the onion). Drain and rinse the canned chickpeas and put them into a large bowl. Chop red pepper, cilantro, and green onions into tiny pieces and toss in with the chickpeas. Drain the water off of the onion and add to the salad. Put the orange juice, lime, agave, salt, and vinegar into a blender and blend for about 20 seconds, until creamy. Drizzle the dressing over the salad and mix well. Serve immediately or cover and place in the fridge to eat later. It can be eaten immediately, but the flavors mix and it tastes better if it is allowed to sit in the fridge for a least a few hours or overnight. This citrus salad keeps well for 3 days in the fridge. Perfect for potlucks, picnics, or lunches! You can leave out the oil for an oil-free salad - it will just not be as creamy. *Updated from original post on April 20, 2017. BEAUTIFUL salad! One that will certainly come in handy during potluck season! Have already pinned! Do you have to skin the chickpeas? No, If you’re using canned chickpeas just drain and rinse, no need to skin them. What a lovely, simple salad – light but filling. And so refreshing-sounding too. So perfect for spring! I’m totally with you on the coriander – I love it. 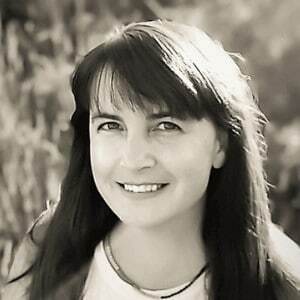 This is definitely a keeper – have pinned and Tweeted! By the way, why do you soak the red onion? Thanks! It is really great for lunches! Enjoy! I LOVE cilantro! And I too think it goes great with some freshly squeezed lime. I’m loving how colorful, and fun this salad looks! Thanks! Cilantro and lime make everything taste so fresh!